Do you want to know how to convert PDF to JPG on Mac? Luckily, we've got a simple solution for you! To convert PDF to JPG image format, a PDF to JPG Converter is needed. In the article below, we'll let you know how to do this using one of the best PDF converter tools currently on the market - PDFelement for Mac. 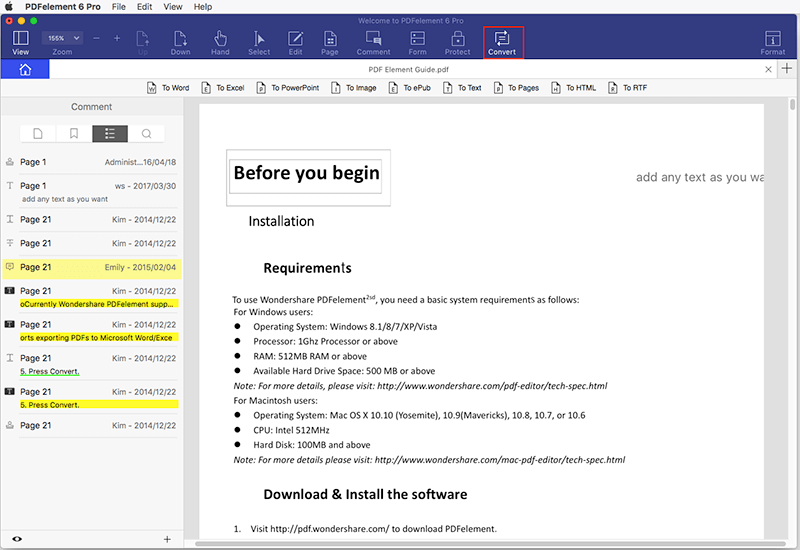 PDFelement for Mac is a desktop application which allows you to convert PDF to JPEG quickly and easily, and vice versa. With PDFelement for Mac, you are able to create PDF from JPG or other image formats as PNG, BMP and more. 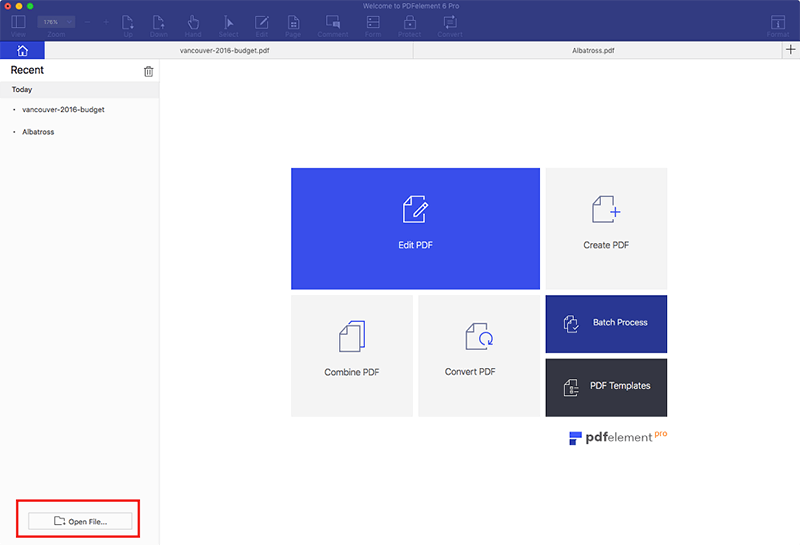 Apart from the impressive conversion function, PDFelement for Mac also lets users edit text and images in PDFs, as well as manage PDF pages by inserting, cropping or extracting pages. It also allows users to add high-level protection to their sensitive documents through the use of password encryption. Last but not least, it's compatible with macOS 10.10, 10.11, 10.12, 10.13, and 10.14 Mojave, so no need to worry about combatibility issues. Click the "Open File" button on the Home screen. Or you can drag and drop PDF files into the program. This PDF to JPEG converter program is able to convert PDF files in batches, so you can import a range of PDF files to perform batch conversion if required. Go to the "Convert" button to reveal the output formats list. Click on "To Image" and select JPG (.jpg) as the output format. After selecting JPG as the format for the output documents, you can further adjust settings and preferences. 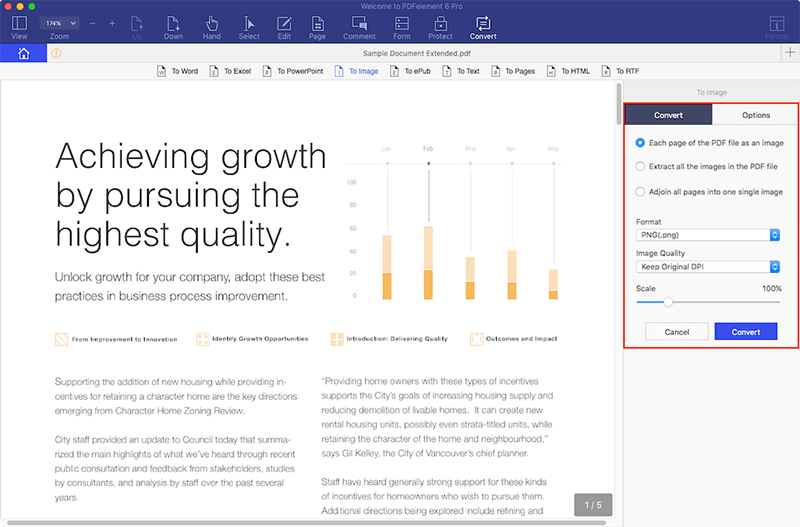 Customize the conversion settings such as Image Quality and Scale on the right-hand side. Hit the "Convert" button to start converting PDF to JPEG on Mac. The conversion will be completed within seconds. After the conversion, you'll see an array of JPEG images in the output folder. This is how to convert PDF to JEPG on Mac.